While Arjuna was busy acquiring the weapons from gods in Heaven, his brothers are accommodated in a hermitage in the earth. Guests, especially the sages, were always welcome in the Pandava abode. One such visitor was the sage Brihadwaswa. In his conversation with Brihadwaswa, the sorrowful Yudhisthira blamed himself for losing everything in gambling with the dice. The sage told him not to despair. He then related to the Pandava, the story of Nala and Damayanti. There was a king of the Nishadas, Nala by name, who was endowed with great beauty and valor. Nala is known for his skill with horses and culinary expertise. He subdued all his enemies and was very charitable. He was much loved by his subjects. Elsewhere, in the country of Vidharba, there ruled a similarly virtuous and brave king, Bhima by name. He had no offspring. The celestial sage Damana once visited him. Learning of the king’s longing for progeny; he granted him a boon whereby Bhima got a daughter and three sons. The daughter was named Damayanti, and the sons were named Dama, Danta and Damana. While the three sons were strong and intelligent, the daughter grew up to be as beautiful as an apsara. Her fame spread far and wide. Many visitors to Nala’s court spoke of the Vidharbha princess’ looks and accomplishments, just as many spoke to Damayanti about Nala’s appearance and achievements. Without meeting, they fell deeply in love with each other. Nala was able to convey his affection to Damayanti through a swan which he caught and whose life he spared. 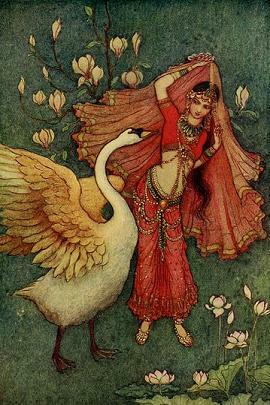 The swan, along with his flock, flew unto Vidharbha and talked to Damayanti in private about Nala’s love for her. The princess favourably responded by sending a message to Nala through the swan. In order to find a suitable husband for Damayanti, Bhima organized a Swayamvara for his daughter. Kings from far and wide in all the worlds heard about the event and set off to Vidharbha to woo the princess. In the celestial world, the gods Indra, Yama, Agni and Varuna became interested in obtaining Damayanti. The four of them proceeded to earth in disguised as humans. While on their way to attend the Swayamvara function, the gods met Nala. They learnt that the prince was also on his way to Vidharbha to attend Damayanti’s Swayamvara. Nala’s majestic appearance stunned the celestials. They thought that their own chances with Damayanti were greatly diminished by Nala’s participation in the Swayamvara. To eliminate him from the competition, they approached him and asked him for a favor. Due to his generous disposition, Nala agreed without knowing what they would ask. The four then revealed their identity and asked Nala to meet Damayanti and plead their case with her. Nala said that he himself was a suitor to Damayanti and hence could not help anyone else in this matter. The gods reminded him of his promise. Nala had to agree. With the help of the four gods, Nala broke through the security in the palace and reached Damayanti in her private apartment. Their first meeting only confirmed their attraction for each other. But Nala told Damayanti about his mission on behalf of the four gods. “It is not wisdom to antagonize the gods. Do choose one of them and remain happy,” he said. Damayanti’s appeal made the gods relent. They also realized that it was destiny that Nala and Damayanti should be married. They assumed their godly forms – they looked splendid, their eyelids did not bat, they had no perspiration, they cast no shadows and their feet did not touch the ground. Damayanti could now see the human Nala and she garlanded him. The gods blessed the couple and left. When the gods were returning to the ether world, they met Kali and Dwapara, the two Yugas (eras in the form of divinity). The Dwapara era, where there remained a modicum of good behavior in the world, was coming to an end. Kali, where morals were plunging to a low point, was slowly establishing his rule. Kali heard the story of the gods’ visit to Vidharbha and was enraged that a mortal could win in a contest with the gods. He wanted revenge. The gods reminded him that it was with their sanction that Damayanti chose Nala. And the four went on their way. The vile and vengeful Kali decided to make Nala suffer for his deed. Saying that he would make Nala lose everything in gambling, he persuaded Dwapara to be his dice. Kali approached Nala’s brother, Pushkara, and enticed him. ‘Invite Nala for a game of dice. I assure you, I would make you win everything he has. You can then rule this vast kingdom.” The greedy Pushkara agreed. Kali could not harm Nala as long as he was pure and devoted to god. He waited for an opportunity when the prince would commit a breach and enter Nala and possess him so that he could make him play dice with his brother. Such an opportunity came when Nala was one day caught performing his evening prayers without washing his feet, an act of sacrilege, contrary to what the scriptures said. Kali now entered Nala’s body and took control of him. He made Nala accept Pushkara’s invitation to gamble. In the deceitful dice game that followed, with Dwapara as the dice, Pushkara made Nala lose his possessions one by one. Nala’s friends and his subjects all appealed to him to stop playing. But he would listen to none, possessed as he was by Kali. The dice game continued for many months, with Nala losing at every throw. Even Damayanti’s words fell on deaf ears. The alarmed queen realized that there was some power driving her husband along the dangerous path. As a precaution, she sent her twin son and daughter to her father Bhima’s house in Vidharbha through a faithful charioteer, Varshneya. Leaving the twins Indrasena and Indraseni along with the chariot and steeds at Vidharbha, Varshneya bade farewell to Bhima and started wandering. He then found employment with King Ritupurna at Ayodhya. Nala eventually lost everything he had to Pushkara in the dice game and he had to leave his capital with only a piece of cloth to cover him. His wife followed him similarly garbed. Pushkara had warned against anyone showing the slightest sympathy for the fallen king. For three nights the couple languished in the outskirts of the city, living on water alone. They then went into the forest. With his garment gone, Nala tore a piece of the cloth that Damayanti was wearing and covered himself. He tried his best to persuade Damayanti to leave him and go back to her father. But the noble lady had no desire to leave her husband in such a state. Nala thought that it was in the best interest of both if he abandoned his wife. After some hesitation, Nala left her that night when she was asleep. He started wandering in the forest. When Damayanti woke up, she found Nala missing. She wailed and cried out for Nala. While ruing her helplessness, a big serpent caught her and was about to devour her. Luckily for her, a hunter who was passing by rescued her. 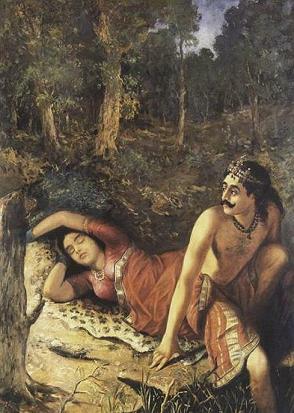 The hunter was attracted by Damayanti’s beauty and wanted to possess Damayanti. By the power of her chastity, however, Damayanti caused the hunter to fall dead. Damayanti wandered aimlessly in the fearsome forest until she reached a place where she found some rishis. The rishis heard her story and blessed her, saying that she would find her husband and become queen again. The next moment, the rishis vanished. A caravan of merchants passing that way found Damayanti. The merchants took care of her and she started traveling with them towards the country of Chedi. On the way the caravan was attacked by a herd of elephants. Many in the caravan were killed. Those who survived the attack took Damayanti to Chedi. There she could get employed by the queen of that kingdom as maid for the princess. Meanwhile, during his wanderings in the forest, Nala encountered a raging fire. From the fire he heard a snake cry out for help, promising to be his friend if rescued. Nala rescued the snake from the fire. On being freed, the snake bit Nala. The next moment Nala’s appearance changed completely. He lost all his good looks and took a hideous form. The snake said, “O mighty one. The venom I have injected in you will torture the spirit possessing you. From now you would be immune to any kind of poison. This change in your form is temporary, so that none could recognize you. Proceed to Ayodhya and present yourself to King Rituparna as Bahuka, the equine expert. He would teach you dice game in return for your teaching him skill with horses. Soon you would regain your wife and kingdom. I give you a garment which will restore you to your true form. You can wear it at a suitable time.” Nala took the garment and proceeded to Ayodhya. Just as the serpent had told him, Rituparna employed Nala to care for the Royal stable. From Rituparna, the Nishada prince learnt all the skills relating to dice game. After some time Bhima came to know through his spies that his daughter was in Chedi. She was soon restored to her father. After hearing her story, Bhima started to search for Nala far and wide. Rituparna’s charioteer, Varshney, by close observation, discovered that Bahuka was his old master, Nala, in disguise. He immediately proceeded to Bhima’s court and told the king about Nala being in Ayodhya in a changed form. Knowing that Nala would never reveal himself to Damayanti in his present form and would refuse to come to Vidharbha, the king conceived of a plan. He sent back Varshney after briefing him of his plan. According to the plan, Bhima sent word to Rituparna that a Swayamvara was being held for Damayanti. Since there was not much time to journey to Vidharbha, Ritupurna engaged Nala to drive his chariot, knowing that he could drive fast. Once Rituparna reached Bhima’s palace, Damayanti met the charioteer Bahuka. She realized that he was indeed Nala. Nala, not wishing to reveal himself to her, kept denying his real identity. But when he saw his son and daughter, he could not resist embracing them. Damayanti approached him and pleaded with him to come out with the truth. Nala finally relented. He took out the garment the serpent had given him and threw it on his shoulder. His original form returned and after four years, Nala and Damayanti were reunited. Kali also left him. Kali offered Nala a boon when he left him. Nala sought the boon that whoever read his story would not be unduly affected by the malefic effects of Kali. Nala went back to Nishada where he enticed his brother to gamble with him again. Pushkara thought that this time he could win over Damayanti whom he coveted, and he consented. But in the dice game, Nala won back his kingdom and all his wealth. Pushkara was disgraced. However, filial affection prevailed, and Nala forgave Pushkara. He gave his brother a portion of his kingdom. The sage Brihadwaswa revealed that he knew the entire science of dice game. At Yudhisthira’s request, the sage imparted the knowledge to the Pandava king. Before Brihadwaswa left, Yudhisthira had learnt all the nuances of the game.